Comfortable , luxurious & I love it?? I love this Forestill sectional. I got the exact set shown -grey!, & knew i’d Have in my home the moment I saw it!!! It’s the perfect size, material microfiber is soft & as , if not more comfortable than it looks!!! I love relaxing in the cozy section...!!! Thanks to Brian & the staff at the King of Prussia store, my house is from Raymour & Flannigans!!! I get compliments from everyone for my sofa but lately... people just can’t choose what to compliment 1st as I recently purchased a fireplace & chair from R & F which added the finishing touches... I THOUGHT-lol!!! I’m about to buy a dining room set...! Brian , my salesman, is great because he gives advice yet lets the items speak for themselves & no pressure !!! Looks awesome and so comfortable. I love the cuddler! 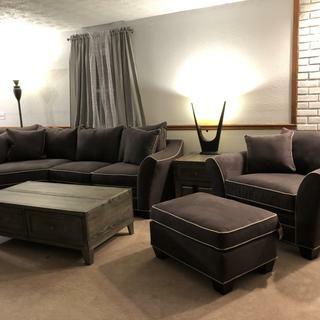 I previously had a leather sectional and was hesitant to purchase the cuddler with loveseat, but I haven’t lost too much seating since the cuddler is so large. This couch is very comfortable. The piping looked white in the store but actually it's a light gray. The slate is a very neutral color which blends well with wood. Fits in a small apartment. i love this couch, it took me a really long time to pick one that i love that would fit in my not so small, but not so large living room, and this really worked! the slate is a really nice color but depending on the lighting it looks purple occasionally, since i have light walls this isnt an issue, but just an fyi. also the inside cushion comes out if the zippers arent fully closed so just make sure the zippers are always closed. Love this color and trim. Perfect for my small living room. can the cushions be taken out of the case and so that the case can be cleaned separately? BEST ANSWER: The cushions are removable. Does this item have fabric and foam/sponge material that has been sprayed with flame retardants? BEST ANSWER: The Foresthill does contain flame retardant.